This lot consists of the Hong Kong 1997 Miniature sheets of definitive sets MNH -see photo's. Condition of sheets is very good - See Photo's. SG116 A FINE USED EXAMPLE CAT £110. Nice sets to add to a collection. 1880 Queen Victoria SG23 Optd. 5c on 8c Bright Orange Used HONG KONG. 1903 ISSUES GOOD TO FINE USED. 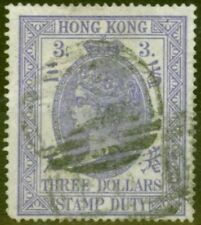 HONG KONG - SELECTION X41 USED STAMPS.UNCHECKED WATERMARKS.DUPLICATION. SG186 pair, top stamp has hinge remain, bottom stamp clean. 1921 King George V SG 118c 2c Grey Wmk. Mult Script CA Used HONG KONG. 1912 King George V SG105 10c. Ultramarine Wmk. Crown CA MNH HONG KONG. Crown CA Used HONG KONG. 1904/6 ISSUES GOOD TO FINE USED "C" ON PAGE UNDER STAMP INDICATES CHALKY PAPER. Sorry these are not corner blocks, as can be seen in the images, they are ordinary blocks of four. New photo added to show marginal details of all sets. 1903 King Edward VII SG71 50c Dull Green & Magenta Wmk. Crown CA Used HONG KONG. HONG KONG1938 King George VI SG157 & SG158 $2 2 stamps Fine Used SEE SCANS. 1921 King George V SG118c 2c Grey Wmk. Mult Script CA Used HONG KONG. 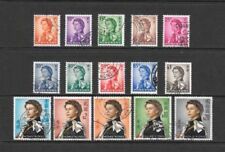 Fine set including duplicates and one variation, 179b (10c reddish violet). Fine mint set with full gum, bearing hinge remainders. Note 'tooth' missing from perfs on left edge of the 25c. New photo added to show marginal details of all sets. All bear hinge remainders, with a few heavily hinged. A FINE USED EXAMPLE CAT £425.